Rated 70/100 based on reviews from all travelers. "Fair budget hotel. Easily accessible by car and close to shopping areas." "Location is ok. Easy car access but inadequate parking." Shopping, restaurants and bars in the area are great. "The service was acceptably friendly and professional, with decent reception staff." Housekeeping and management are lacking. "So-so beds and decent, big rooms." Poor TV's and furniture, and inadequate room cleanliness. Small rooms and poorly cleaned bathrooms. Poorly-maintained rooms with inadequate A/C and bad minibars. Kitchenette is acceptable. Shower can be a problem. "Breakfast affordable but not highly reviewed." "Poor dining experience with untidy dining area." "Poorly reviewed buildings and an uninspiring entrance area." Hotel grounds need more attention. "Rooms, bathrooms and dining area all need more cleaning." Hotel facilities could use a good clean. Moderately clean pool area. Rated 56/100 based on reviews from families. "Service is friendly enough, with acceptable reception staff." "Reasonably comfortable, large rooms, but disliked beds." "Kitchenettes and rooms, generally, are OK, although could use some maintenance." Large but poorly cleaned rooms with substandard bathrooms and beds. "Rooms could be cleaner. Hotel facilities could use a good clean." Rated 56/100 based on reviews from couples. Rated 66/100 based on reviews from all travelers. Rated 54/100 based on reviews from families. Rated 55/100 based on reviews from couples. Terrible hotel; no housekeeping on weekends, even though the website said Daily Housekeeping in the Amenities section. That's false advertising. Breakfast area was dirty, with sticky tables, and moldy bread. Someone had overcooked something green and sticky in the microwave before we arrived, and the microwave was never cleaned for the next two days we were there. Please accept our sincerest apologies for the housekeeping issues that you encountered during your stay in our hotel. We thank you for taking the time to share your experience and we want to assure you that the housekeeping issues which you have brought to our attention are being addressed with renewed efforts to improve upon our policies to ensure that each guest has a pleasant and comfortable experience in the future. share this experience. Clean, well-maintained accommodations is our goal, so it's disappointing to read about your observations. We hope you let our front desk team know. Meanwhile, we will notify maintenance about the bathroom issues and will alert housekeeping about your other remarks as well. We know we can do better and will use your feedback to ensure that no guest has this experience in the future. I rented the penthouse and it should be called the outhouse. I was very disappointed in the appearance of the room. The floors were old, stained and the bathroom had water damage with a broken door. I checked out immediately and returned in the morning for a refund. The manager was very pleasant and understanding of my complaints. our hotel. Clean, well-maintained accommodations is our goal, so it's disappointing to read about your observations. We hope you let our front desk team know. Meanwhile, we will notify maintenance about the bathroom issues and will alert housekeeping about your other remarks as well. We know we can do better and will use your feedback to ensure that no guest has this experience in the future. This was by far the nastiest, filthiest, most trifling hotel I’ve ever seen!!! I’ve traveled throughout the US & multiple countries and NEVER experienced anything like this. Wyndham should be absolutely ASHAMED that this hotel is in their portfolio. It needs to be COMPLETELY overhauled from top to bottom including employees, management (or lack thereof) & OWNERS. I don’t know where the pictures they display online came from but it’s definitely not of this place. The pull out sofa looked like someone had been MURDERED on it. I could explain (and have pictures) of everything else we experienced during our horrid one night stay here but at this point I’m just so emotionally drained by the whole experience that I can’t waste anymore energy on it. My main objective right now is getting back back the refund they’ve promised (after drafting MORE than what was supposed to be in the first place). We’ll probably end up having to dispute the charges with the bank to get our money back since management isn’t responsive via phone. Everytime we call it’s a different excuse of why the manger is unable to take the call. That behavior was completely expected as we couldn’t get any response to our issues when we were physically there so didn’t expect any help being given over the phone. I REALLY hope someone from Wyndham is seeing all these reviews as they can’t all be made up. WYNDHAM, you really need to do something about this facility!!! Thank you for completing our guest satisfaction survey and letting us know about your recent experience at our hotel. We want you to know that we take your comments to heart and that we are continuously discussing and implementing new ways to improve upon the guest experience at our hotel.We hope you'll return someday to see how we have addressed and improved upon the issues that you have expressed, thanks to your valuable feedback. The only thing professional was when we checked in the young man checking us in went out of his way to make sure we got a ground floor as my husband is blind. Other than that, the place was dirty, rooms weren't tended to, people were sleeping in the lobby and some employees acted like the didn't want to assist anyone with requests except for the young man who checked us in. Thank you for pointing out the issues with housekeeping so that we can work to improve upon this aspect of the guest experience at our hotel. It is distressing to hear that you encountered a number of issues with our housekeeping and guest services and I want you to know that we take your comments very seriously and are working hard and fast to address these problems in hopes of improving upon the guest experience. We promise you a better service and a professional staff. With a stay at Hawthorn Suites by Wyndham North Charleston, SC in North Charleston, you'll be within a 10-minute drive of Charleston Tanger Outlets and North Charleston Coliseum and Performing Arts Center. This hotel is 9.6 mi (15.4 km) from Riverfront Park and 13.7 mi (22.1 km) from College of Charleston. Make yourself at home in one of the 96 guestrooms, featuring kitchens with refrigerators and ovens. Your pillowtop bed comes with down comforters and Egyptian cotton sheets. Wireless Internet access (surcharge) keeps you connected, and cable programming is available for your entertainment. Conveniences include desks and microwaves, as well as phones with free local calls. Enjoy a range of recreational amenities, including an outdoor pool, a spa tub, and a fitness center. Additional amenities at this hotel include complimentary wireless Internet access and barbecue grills. Mingle with other guests at the complimentary reception, held on select days. A complimentary hot/cold buffet breakfast is served on weekdays from 6 AM to 9 AM and on weekends from 6:30 AM to 9:30 AM. The preferred airport for Residence Inn by Marriott North Charleston is Charleston, SC (CHS-Charleston Intl.) - 6.1 km / 3.8 mi. 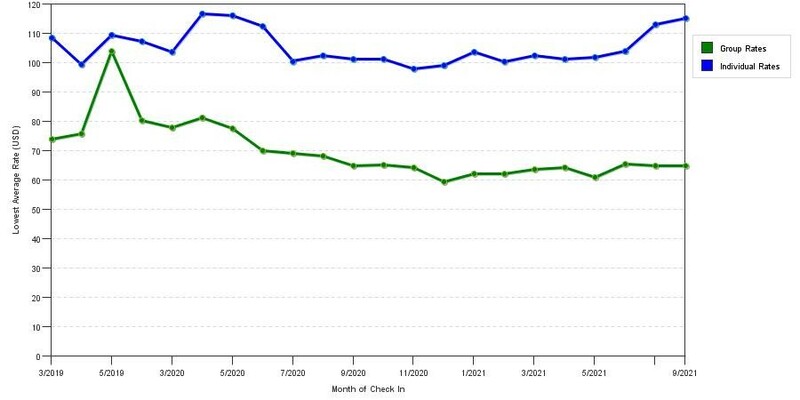 The graph above is averages of room rates for both our group quotes and the lowest online individual rates our rate checker could find at the time the group offer was entered. The best group deal shown is 25.0% in January 2019 and the highest average individual rate is $122 in the month of February 2019. This chart will show past seasonality and also project future months. If you are flexible with dates, you may want to consider staying at Hawthorn Suites by Wyndham North Charleston Sc in a month when rates are lower.